← HBS Professors – Do They Know? Anyone considering to apply to an MBA program is familiar with the MBA Rankings. Rankings come in different types and focus on different aspects, but at the end of the day, the schools are mostly being audited and ranked on things like out-of-school salaries, GMAT scores and % salary increases. Most of these things seem heavily correlated with what to expect about life AFTER school, but very little with life DURING school. After all, with the typical US MBA program being a 2-year endeavor, one could wonder if quality of life during these 2 years should be an aspect to consider for students when applying to schools. This quality of life can include things like local cost of living, crime rates, number of non-stop airline connections and cultural life of the city. But as I made my way back to Boston last week after a long and well-deserved winter break abroad, I was hit so hard by the cold that I decided to make my own MBA ranking based on a quality of life parameter that really matters to me: the climate! 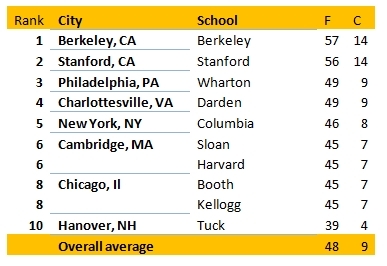 In short and not surprisingly so, Berkeley-Haas and Stanford are topping this weather ranking. Tuck seems to be the biggest victim of my approach. 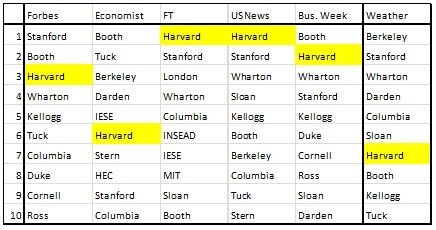 Interestingly so, when incorporating my ranking with the other ranking data I collected, I seem to have developed a rating system that gives Harvard its worst ranking across the board. Now here is a real challenge for the HBS administration – get the weather right! Overall MBA rankings – including the weather one! 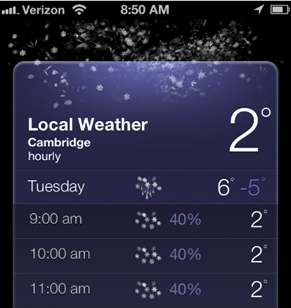 This entry was posted in Life in the USA and tagged Boston winter, Cambridge, HBS ranking, MBA Ranking, weather. Bookmark the permalink.